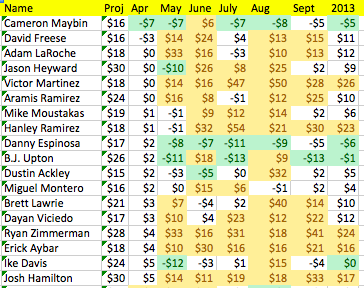 So, we learned that if you paid real money for a pitcher and he had a bad April, chances were pretty good he would bounce back to be the pitcher you hoped for in subsequent months (if not for the year as a whole). But if you didn’t pay a pitcher much a bad April was a bad sign, while a good April was a sign that your $1 pitcher might be fine all season long. The yellow cells represent Top 33 percent performance, while the green cells represent Bottom 33 percent performance. This coterie are hitters who cost $15 or more, ranked by the lowest April earnings. 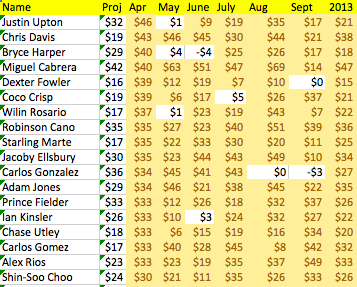 Only two of these 18 hitters outearned expectations on the year, and 11 earned $10 or more less than they were paid in the auction before last season. This group was paid $371 on auction day, and their month-by-month earnings were: $25, $100, $212, $188, $288, $224, for an end of year total of $173. (Note that these “earnings” are all in the same scale of $3120 each per AL and NL, per month.) The slow starters earned 44 percent of expectations. How about the fast starters? This group started with higher expectations. They were paid a total of $462. Their monthly earnings were: $651, $408, $426, $524, $568, $413. They earned a profit as a group in three of the six months. On the year they earned $498, 108 percent of expectations. None of the top guys had a month that ranked in the Bottom 33 percent. I used to think that the advantage of having guys get off to a good start was the leverage that getting stats early afforded. Once you’ve banked a good month or two, you can deal for your needs, knowing that you’re ahead of your expectations on production from the fast-starting players. But these charts suggest that guys who get off to good starts are more likely to continue to produce, which is even more valuable than leverage (especially since you can have both going at once, depending on your team’s needs). One Response to Hot and Cold Starts for Hitters. Do they mean anything?